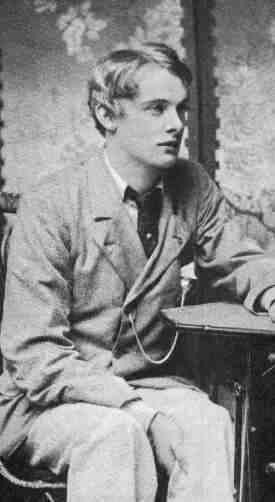 Lord Alfred ‘Bosie’ Douglas (1870 – 1945) is best known as Oscar Wilde’s lover, and is often blamed for Wilde’s downfall. However, he was a poet in his own right. He lacked the genius of the older man, but some of his work is very lovely. The most famous, of course, is ‘Two Loves’ – one of the pieces of literature quoted at Wilde’s trial as evidence against him. One of my other favourites though, and a much lesser-known poem, is called ‘The Dead Poet’. Douglas wrote it after hearing the news of the death of his exiled former lover. And voiceless thoughts like murdered singing birds. And so I woke and knew that he was dead. A lot of Wilde fans blame Bosie for what happened, but I actually feel more pity for him than anything. Yes, the relationship with Oscar was clearly a destructive one, and yes, Douglas was obviously very selfish at times, but with Queensbury for a father who wouldn’t have issues? Also, he truly knew how to live decadently (before he turned to Catholicism at least), and that is something I can always appreciate. I adore Bosie…his poetry is so underrated. I found you via Tumblr — you have a gorgeous blog! You might like mine as well: http://www.thefindesiecle.com (devoted to art, literature and culture of the 1890’s). Thank you very much! I love Bosie too – I can’t understand why his poetry isn’t rated that highly. Thank you for the link – I’ve just added you 🙂 Would you mind if I put you on my blogroll here? His poetry is not rated highly because it is pedestrian. Oscar Wilde was not a particularly gifted poet either. As a playwright he was nonpareil. As a teller of tales he had sheer genius but at poetry neither Oscar nor Bosie excelled. The fact that they were lovers had nothing whatsoever to do with it.